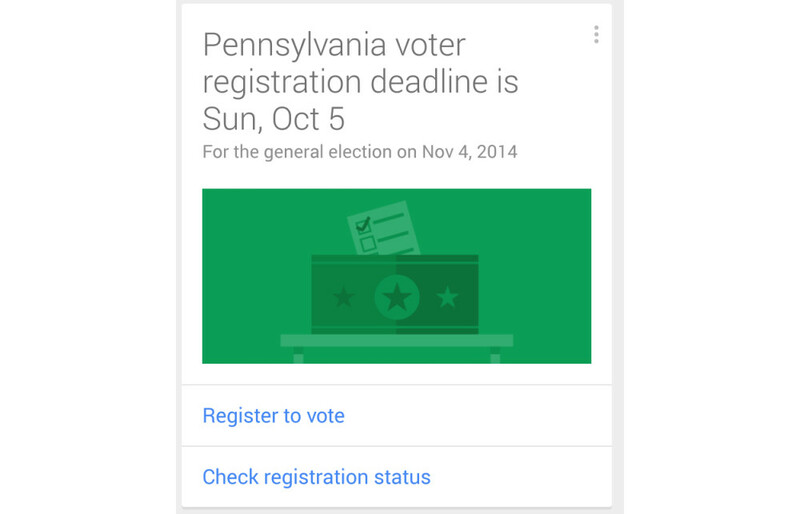 At some point today, Google started show a voter registration card in Google Now to Pennsylvania residents. The card appears to be showing just because of the user’s location, not because they had previously searched for “voter registration” or about an upcoming election in the state. At least one reader said they have not searched for anything politically-related on Google “in a long time” and that they certainly haven’t searched for “voter registration” since they first voted back in 1998. They also asked around at work to see if other co-workers were being presented a similar card, and sure enough, they were. As you can see in the card, Google is telling users when the deadline to register is to vote, but also when the upcoming Pennsylvania general election takes place. There are buttons for checking registration status and registering to vote as well. Anyone outside of Pennsylvania seeing a similar card?